To Cite: Delaram M, Jafar Zadeh L, Shams S. The Effects of Lidocaine and Mefenamic Acid on Post-Episiotomy Pain: A Comparative Study, Shiraz E-Med J. 2016 ; 17(3):e36286. doi: 10.17795/semj36286. Background: Most women suffer pain following an episiotomy and oral non-steroidal anti-inflammatory drugs are commonly used for pain relief. Due to the gastrointestinal side effects of oral drugs, it seems that women are more accepting of topical medications for pain relief. Objectives: Therefore, the aim of this study was to compare the effects of lidocaine and mefenamic acid on post-episiotomy pain. Patients and Methods: This clinical trial was carried out in 2011. It involved sixty women with singleton pregnancy who were given an episiotomy at 38 to 42 weeks of gestation. The participants were randomly divided into two groups. One group received 2% lidocaine cream (n = 30), while the other group received 250 mg of mefenamic acid (n = 30). The data were collected via a questionnaire and a visual analog scale. Pain intensity was compared from the first complaint by the mother and at 6, 12, and 24 hours after the delivery in both groups. The data were analyzed using SPSS (version 16), the t-test, and the paired t-test, and a P value of less than 0.05 was considered significant. Results: The mean intensity of pain at the first compliant was 4.92 ± 1.9 in the lidocaine group and 4.90 ± 1.5 in the mefenamic acid group, and the difference was not statistically significant (P = 0.20). Additionally, there was no significant difference in the mean intensity of post-episiotomy pain between the two groups at 6 (P = 0.05), 12 (P = 0.36), and 24 (P = 0.98) hours after childbirth. Conclusions: The effects of the lidocaine cream and mefenamic acid were similar in terms of the relief of post-episiotomy pain. Lidocaine cream therefore represents a good alternative to mefenamic acid, which is commonly used to reduce pain following an episiotomy, especially in women who are breastfeeding and who wish to avoid oral analgesic drugs being secreted in their milk. Episiotomy is a common surgical procedure that is performed during childbirth, although little evidence supports its routine use (1, 2). At least 35 45% of women in developing countries who give birth in a hospital setting are given an episiotomy (3). The perineal pain experienced due to receiving an episiotomy is severe during the first few days after delivery, and it can lead to limitations in movement and difficulties with urination and defecation (2). Studies have also shown that episiotomy-related pain may affect sexual contact (4). Different pharmacological methods are commonly used for the relief of perineal pain following an episiotomy, including aspirin-codeine, acetaminophen-codeine, sodium diclofenac, and non-steroidal anti-inflammatory drugs (NSAIDS). The non-medicinal methods applied for pain relief include cold and heat, acupressure, acupuncture, relaxation, distraction, and music therapy (5). The use of oral analgesics is common, although their adverse effects include constipation, nausea, abdominal pain, and dizziness, all of which limit their use. Due to the adverse effects of oral analgesics, topical pain relief methods have been considered, including hot and cold compresses, topical anesthetic, and radiation. Lidocaine gel is one of the local anesthetics used for pain relief. It blocks the sensory neurons of neuronal membranes by inhibiting sodium, thereby preventing the transmission of nerve messages and the sensation of pain. Indeed, 2% lidocaine gel influences the structure of the perineal nerve through the skin or membrane (6). In obstetrics, lidocaine gel is used to anesthetize the perineum during the second stage of labor, and its benefits include less systemic absorption and increased ease of administration (7). In terms of the effect of lidocaine on post-episiotomy pain, previous studies have reported conflicting results. For example, one study reported that the severity of the perineal pain in the group that received lignocaine gel in the first 48 hours after childbirth was less than that in the group that received a placebo (7). However, another study reported opposite results (8). Non-steroidal anti-inflammatory drugs are analgesic agents that are commonly used worldwide, and their effectiveness in the treatment of acute pain has previously been studied (9). Such drugs inhibit the oxygenase cycle and reduce the production of prostaglandins (10). Their physiological effects involve protecting the gastric mucosa, regulating the renal blood flow, and setting the tone of the vascular endothelium (11). They also play an important role in inflammation, although the mechanism of this action has not yet been fully explained (12). Mefenamic acid is one of the NSAIDS used for the relief of pain following an episiotomy. It is more commonly used in the treatment of primary dysmenorrhea, headache, toothache, and postoperative pain. It has been suggested that mefenamic acid should not be taken for more than seven days. The typical adult dose is 500 mg three times a day, although the dose is different for children. After ingestion, mefenamic acid is rapidly absorbed and it has a short half-life of approximately 2 hours (9). A review of four studies that involved a total of 842 people reported that the degree of pain experienced after receiving 500 mg of mefenamic acid was reduced in 50% of patients, whereas the pain reduction was 20% in the group that received a placebo (13). Little research has previously been conducted comparing the effects of lidocaine and mefenamic acid in reducing the perineal pain experienced after an episiotomy. Since no prior study has compared the effects of lidocaine cream and mefenamic acid on post-episiotomy pain in primiparous women, this study was carried out to compare the impact of the two methods of pain relief on episiotomy-related pain in a teaching hospital in Shahrekord, Iran. 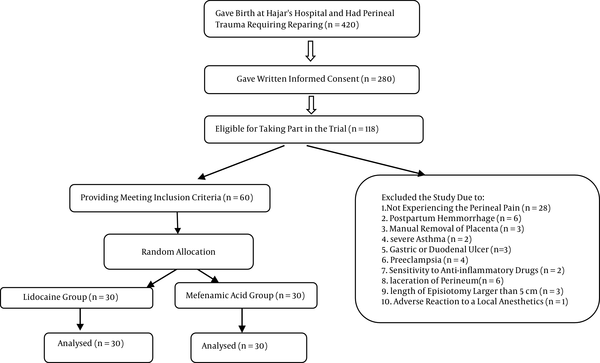 This study involved a randomized controlled trial that was conducted from February 2011 to December 2011 at the antenatal clinic and post-delivery ward of Hajar hospital, a university hospital and referral center for obstetric care in Shahrekord, Iran. Permission to conduct the study was received from the deputy of research and the ethics board of Shahrekord University of Medical Sciences (code of ethics: 90‑4‑9). The study also received a clinical trial code from the Iranian registry of clinical trials (IRCT201104253078N7). During the study period, a total of 420 women who gave birth at Hajar hospital experienced perineal trauma during childbirth that required repair. Some 280 of those women gave written informed consent to take part in the study and 118 of them were found to be potentially eligible to participate. Of those, 58 women were excluded from the study, while 60 women who underwent a normal vaginal delivery and mediolateral episiotomy, and who met the inclusion criteria, were selected by convenience sampling. They were randomly allocated into the two groups. One group (n = 30) received 250 mg of mefenamic acid, while the other group (n = 30) received 2% lidocaine cream (Figure 1). The randomization was performed according to a random number table. The exclusion criteria included women who had a postpartum hemorrhage, manual removal of the placenta, severe asthma, gastric or duodenal ulcer, and preeclampsia. Women with a known sensitivity to non-steroidal anti-inflammatory drugs, a laceration of the perineum, an episiotomy longer than 5 cm, and an adverse reaction to local anesthetics were also excluded. The participants received written and verbal information about the study at 37 weeks at the antenatal clinic and they were given the same information on admission to the postnatal ward by the ward midwife. All participants who agreed with the study procedures and volunteered to participate signed the free and informed consent form. Neither the women nor the investigators could be blinded to the purpose of the study, although the individual responsible for data analysis was blinded. After the birth and at the time of admission to the post-delivery ward, the intensity of the perineal pain was assessed by the ward midwife using a visual analog scale (VAS) at the time of first complaint by the women and prior to them taking the first dose of their allocated medication. Then, 250 mg of mefenamic acid was administered to the patients in the first group, while the patients in the second group received 5 ml of 2% lidocaine cream on the episiotomy line. The topical lidocaine cream was manufactured by the Tehran Chemie Pharmaceutical Company (Tehran, Iran) and each 100 g of the cream contained 2.5 g of lidocaine and 2.5 g of prilocaine. The mefenamic acid was manufactured by the Raha Pharmaceutical Company (Esfahan, Iran). The drugs were available in the hospital pharmacy. Socio demographic information was provided by the patient records. The visual analog scale asked the women to score their pain from 0 = no pain to 10 = worst possible pain (5). The primary outcomes were pain scores at 6, 12, and 24 hours after birth and with rest. The secondary outcomes relating to pain were the frequency of use of the allocated medication, use of additional analgesia, time from birth to first analgesia, dosing intervals, and any adverse effects of the therapeutic medications. The data were analyzed using SPSS (version 16). The categorical variables were compared using the χ2 and Fisher’s exact tests, while the continuous variables as measured on the visual analog scale were compared using the independent samples t-test. A P value of less than 0.05 was considered to be statistically significant with a confidence interval of 95%. The individual responsible for analyzing the data was blinded to the treatment groups. The two groups were well balanced in terms of their demographic characteristics upon entry into the study, as well as their labor and birth outcomes (Table 1). The study outcome data were available for 100% of the women at 6, 12, and 24 hours after birth. A comparison of the mean intensity of pain in the two groups is presented in (Table 2), which shows that there is no statistically significant difference in the intensity of pain at the point of first compliant following rest between the two groups (P = 0.20). Additionally, no significant difference in the intensity of pain at 6 hours after childbirth was found between the two groups (P = 0.05). The mean intensity of the post-episiotomy pain was also not significantly different at 12 hours after childbirth between the two groups (P = 0.36). Further, the difference was still not significantly different at 24 hours after childbirth between the two groups. There was no significant difference in the incidence of using the medications during the 24 hours after delivery (P = 0.98), receiving additional analgesic for pain relief, and the time from birth to the first additional analgesia (Table 3). No adverse effects of the therapeutic drugs were reported in the two groups. aValues are expressed as mean ± SD or No. (%) of women. The mean birth weight was 3071 ± 439 g in the group that received lidocaine and 3016 ± 419 g in the group that received mefenamic acid, and the difference was not significant (P = 0.62). No significant difference was found in the Apgar score at 1 minute after birth and upon admission to the neonatal intensive care unit (NICU). The mean frequency of drug use was 3.20 ± 1.9 in the lidocaine group and 3.22 ± 1.7 in the mefenamic acid group, and again the difference was not significant (P = 0.40). No adverse effects of the drugs were reported. The findings of the present study showed that both lidocaine cream and mefenamic acid were able to reduce the severity of post-episiotomy pain over time, and there was no significant difference in the intensity of pain between the two groups. Only a limited number of studies have previously been conducted to compare the effects of two sedative pain following an episiotomy. In this regard, a study conducted in Ireland reported mefenamic acid and lignocaine to have similar effects on the severity of post-episiotomy pain (14), which is consistent with our findings. Delaram et al. cited Abedzadeh (5) when noting that lidocaine gel reduced the intensity of pain at 6 and 12 hours after administration. Another study showed that lidocaine cream was able to reduce the severity of pain after an episiotomy within 15 minutes of delivery, although this effect was not present at 30, 60, and 90 minutes after birth (15). Yet, in another study, although the recipients of lignocaine gel reported less pain than the placebo recipients, the difference was only significant at 48 hours after delivery (7). Further, a study reported that lidocaine gel and a diclofenac suppository have the same effect on episiotomy pain relief during the first day postpartum (16). Studies that examined the effect of mefenamic acid on dysmenorrhea reported the drug to reduce the pain in primary dysmenorrhea (17). In a study conducted with the aim of reducing acute pain following surgery using mefenamic acid, the recipients reported at least 50% pain reduction with 500 mg of mefenamic acid after 6 hours, while this rate was 4% for the placebo group (9). The need for an additional analgesic was also lower in the group that received mefenamic acid than in the placebo group (9). Another study reported that the administration of 500 mg of mefenamic acid is effective in relieving moderate to severe pain after surgery (13). The mode of delivery (i.e., normal delivery, forceps, or vacuum) can affect post-episiotomy pain; however, in the present study there was no significant difference in the mode of delivery between the two groups. A study from Colombia reported that when forceps are used for delivery, there is a greater need to use an analgesic to reduce pain after an episiotomy (18). The type of episiotomy can also be effective in reducing pain. Since we only used a mediolateral episiotomy in the present study, this confounder variable did not affect the results. Additionally, the effect of the analgesic drugs used during labor and after giving birth could affect the outcome of the study, although there was no significant difference between the two groups in this regard. Although the present study found no significant difference between the effects of lidocaine cream and mefenamic acid on post-episiotomy pain and hence determined that lidocaine cream is a good alternative to mefenamic acid, it should be noted that some patients may prefer the oral form of a drug to the local form (19). Although the study did not report any adverse effects of the utilized drugs, the potential side effects of these drugs should still be noted and the necessary care provided. The strengths of the present study were the random assignment of participants to the study groups and the measuring of the side effects of the medications. The relatively small sample size and the inability to follow the patients and assess their pain intensity at 48 hours and during the first week after delivery can be seen as limitations of the present study. The effects of lidocaine cream and mefenamic acid on the relief of post-episiotomy pain were similar. Lidocaine cream is therefore a good alternative to mefenamic acid, which is commonly used to reduce pain following an episiotomy, especially in women who are breastfeeding and who want to avoid oral analgesic drugs being secreted in their milk. This work was supported by grants from the medical research council of Shahrekord University of Medical Sciences in Iran (grant NO.976). The authors especially wish to thank the women who participated in the study. The study was registered at www.clinicaltrials.gov. The protocol registration system was IRCT201104253078N7.